As cherry season begins to wind down, enjoy them every chance you can. Simple can be best, as a big bowl presented as dessert with small bowls alongside for stems & pits, can be the perfect finish to a meal. I am often reminded of the simplicity and sublimeness of the bowl of tangerines and dates served at Chez Panisse with my friend Mimi. Beautiful perfectly ripe in season fruit served just as it is can be one of the very best desserts. Mister Sive is sharing this awesome recipe this morning–take it away Ted! One of the pure food joys of living in Washington State is the abundance of cherries this time of year. We Teds consume an inordinate amount of them come early Summer, with breakfast yogurt and granola, by the handful for a snack, or, as below, for dessert. Last weekend our beloved Vashon Thriftway had these perfect Rainier cherries, and I was determined to build dessert around them. It was also an opportunity to use one of my favorite kitchen gadgets, a cherry pitter that’s a lot of fun (and a bit of a workout) to use. The following recipe is inspired by one in the NY Times Cooking app, and blends the moist, rich and deep scent of pound cake with a touch of cornmeal, that cherry zing, some almond crunch, that classic upside-down cake topping of butter and sugar, and the (optional) hint of sweet and fruity tequila. Pour this mixture into the bottom of a large springform cake pan, and spread evenly. Mix in 1/3 of the egg whites to the batter. Fold in the remaining 1/3 of the egg whites. Bake 45 to 55 minutes, until a knife inserted into the dough (only) comes out clean. Let the cake sit for a few minutes, then snap off the side of the pan, place your serving plat upside down on top of the cake, and turn over, revealing those wonderful cherries! Serve. Save the leftover cake in the fridge. The moist dough will get a bit dense, but fear not! This turns into a terrific “twice-baked” treat. Slice the cake into 1 ½ inch slices. Lay each slice with a big side face down on a baking sheet, and heat in a 350-degree oven for 5 minutes. Flip onto the other side for another 5 minutes. This warms the cake and gives a nice super thin crustiness to each piece. Serve with piping hot coffee for a mid-morning treat! We were in Eastern Washington this week-end close to Leavenworth for a family wedding. It was beautifully sunny and warm. The dry air is such a treat. Meandering back stopping at farm stands this time of year is such a treat too. The cherries just so abundant. Whether they are Eastern Washington cherries or whatever area you are finding them, the season is short but oh so sweet. Try them next to cheese. We found a piece of Beecher’s yesterday on one of our stops and they are divine together. Pit them and toss in your next salad. Mix them with corn for a sweet and tart dish on your next picnic. However you enjoy them, savor the flavor, as they are a sweet marker that Summer is upon us. Putting together things to have with cocktails or for when guests come for a simple dinner and we want to have a little something out before the meal, is when I like pairing things with cheese. It is a one-two punch of flavor and ease. That is where Manchego with cherries comes into play. If you can get fresh cherries, then by all means do. 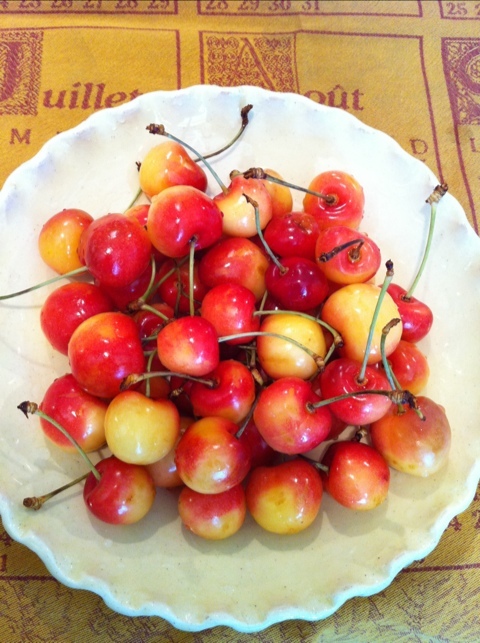 The Italian Amarena cherries are fab when you want cherries but they are not in season. The lovely woman from Met Market that helped me at my signing last week chopped up these cherries and had them sitting atop a piece of the cheese. For ease, I like them in a bowl on a pretty plate next to the cheese left whole. I like seeing that it is a whole cherry. The mix of the sweet & tart cherry combined with the mellow sweetness of the Manchego makes for a winning combination. So good! 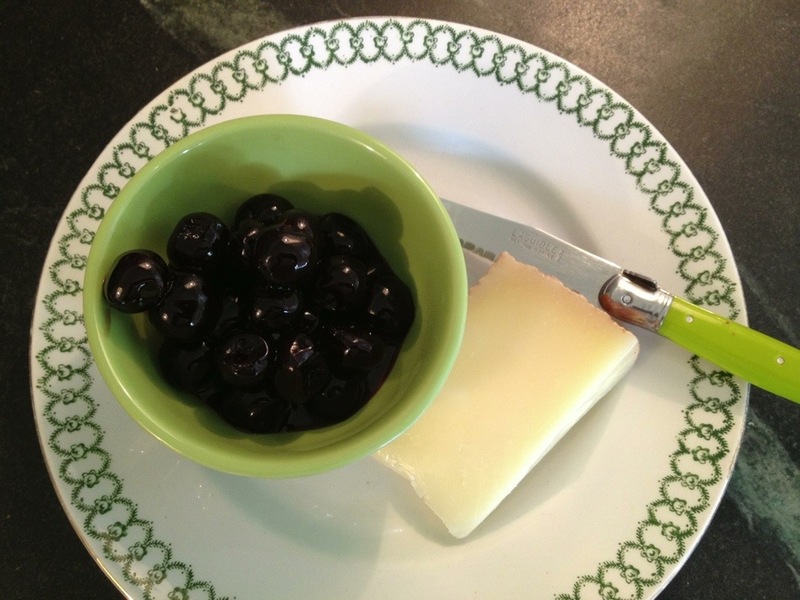 The above photo of the Spanish cheese, with the Italian cherries, on the plate from England, with the knife from France just made me laugh after I posted it. A combo of some of my very favorite places…. We are up early and heading into the city today. I wish all of you just the very best Wednesday. Just can’t seem to get enough kale. Love it. So healthy for you. So filling. What I also love about it is how well it keeps in the fridge. I bought a good sized bunch the day we got back from New York almost 2 weeks ago. Still was going strong when I took it out yesterday to make a little salad to take to the shop. 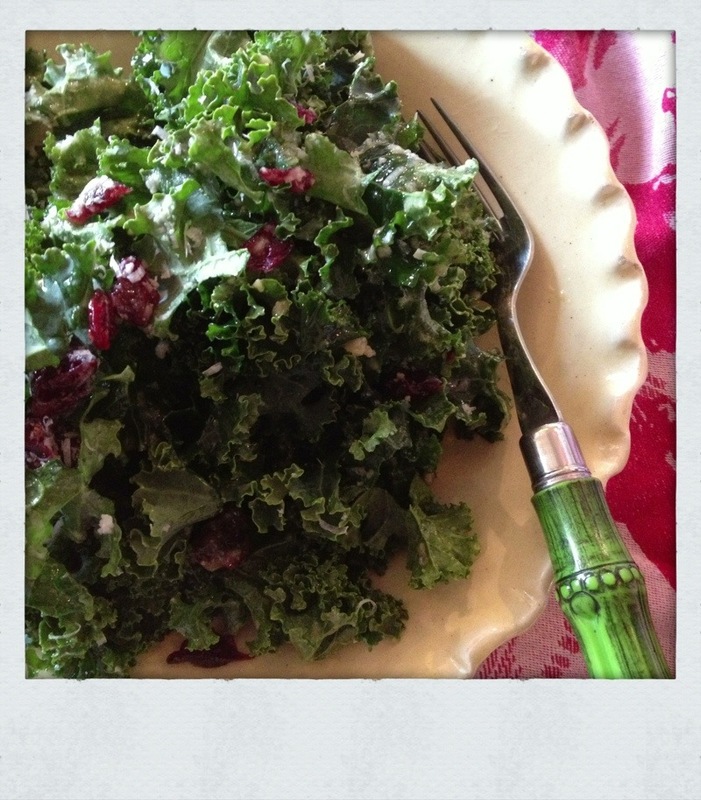 Kale is also so great as it does not wilt easily, making it super transportable for salads for lunch, picnics, whenever. I just put the vinaigrette in the container first on the bottom and put the kale directly on top. 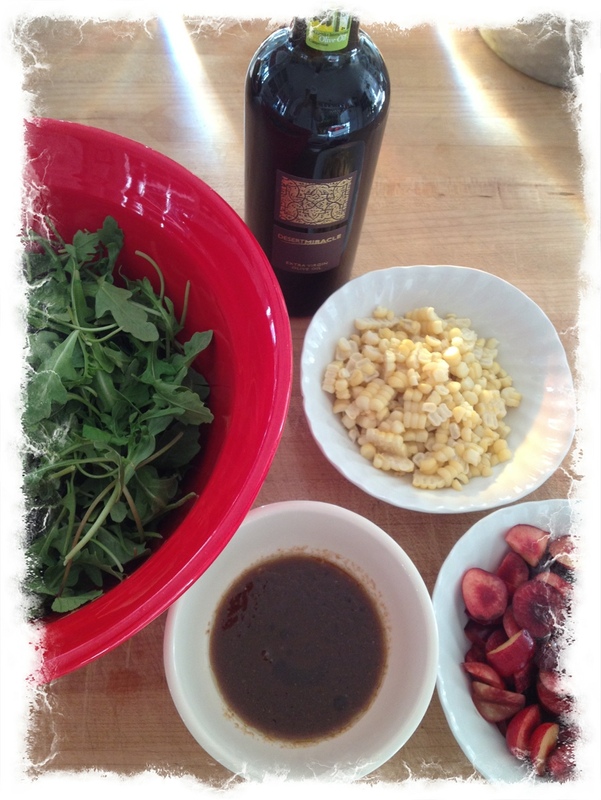 When I am ready to serve it, I just shake the whole thing around, and the salad becomes perfectly dressed. For the vinaigrette, maple syrup helps tremendously to add a bit of sweetness and take away any bitter the kale might have. In a bowl add a big dollop of Dijon mustard. To that add a few good glugs of maple syrup. Then the juice of one lemon. Salt & pepper. Then whisk in extra virgin olive oil until it all incorporates. Finally add Parmesan that has been grated super fine. Combine all for a flavorful vinaigrette. 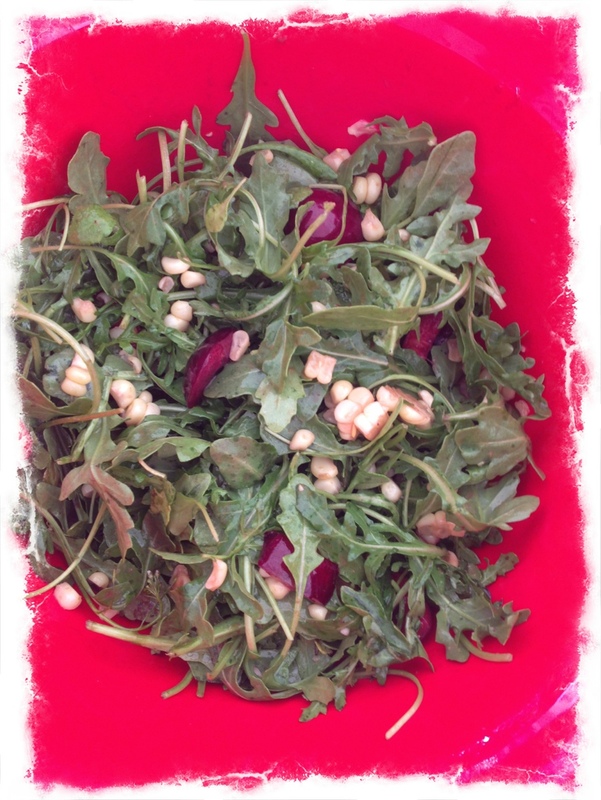 I most times like to add dried cherries or cranberries to the salad. Yesterday it was cherries. Tear up kale into bite sized pieces, being sure to omit the tough spine. I just tear around the spine and discard them. Once all is mixed together, add another sprinkling of Parm to the top of the salad. I had it alongside Beecher’s mac & cheese, for a hearty, tasty lunch on a rainy day at the shop. Farro is the oldest cultivated grain in the world. The hearty kernel also makes it a substantial base for a healthy salad. Saturdays are days I quite often make something to bring to the shop for lunch, as it is such a hopping day. We had a butternut squash in the fridge, so I thought I would roast that up, get a little creative, and see what I could come up with. I love salads where you can mix & match, using things that work well together. 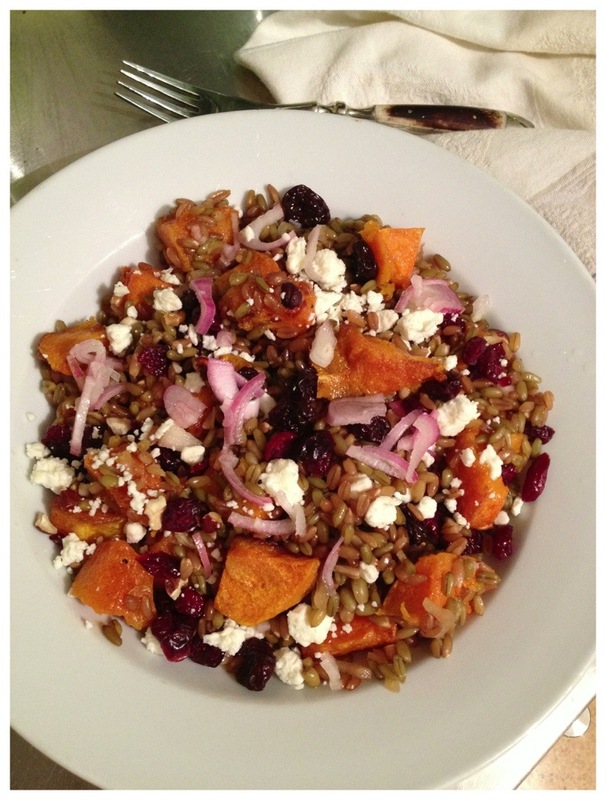 Here is what I added to the farro to make a filling lunch for a busy day. Cook farro to the instructions on package. I like it not so crunchy, so I tend to cook it a bit longer than the norm to get a tad softer. Roast cut up butternut squash at 400 degrees with olive oil, salt and pepper until soft and a bit golden. Set aside. Cut up a shallot into small pieces and add to a bowl with 3 tablespoons of rice wine vinegar and a pinch of salt. Let that sit and pickle for a bit. The longer the better. At least 30 minutes is best. While the farro is cooking and the shallots are pickling, take a small pan and dry roast a handful of hazelnuts until warm. This helps bring out the natural oils of the nut, really helping bring out the full flavor of the hazelnuts. Set aside. Once the farro is cooked, take off of heat and add half of the shallots and half of the rice wine vinegar they were sitting in. This will infuse into the warm farro and add quite a bit of flavor. Add a few good pinches of salt and pepper at this stage too. Let cool. Once cooled, add the butternut squash pieces, the remaining shallots, the hazelnuts, a handful of dried cherries, and finish with a good amount of crumbled feta. Mix all together. Taste. Season with more salt if you think it needs it. Also add the remaining vinegar that you pickled the shallots in, if you desire more. Done. A quite healthy and visual lunch. A happy Monday and start of the week to you all! We are spending most of the week out on the island, and I am getting a start on my book. I find it such a peaceful place to write. I don’t know what it is about writing at times, but it makes me hungry. My breaks mean messing around in the kitchen trying new things. TPS had a full day in the city, so I wanted an easy dinner ready when he arrived back to WestWard, but he was not sure which ferry he would catch. It would be a sort of Italian meal that could be prepared ahead of time, and sit till he arrived. I love those sorts of meals. 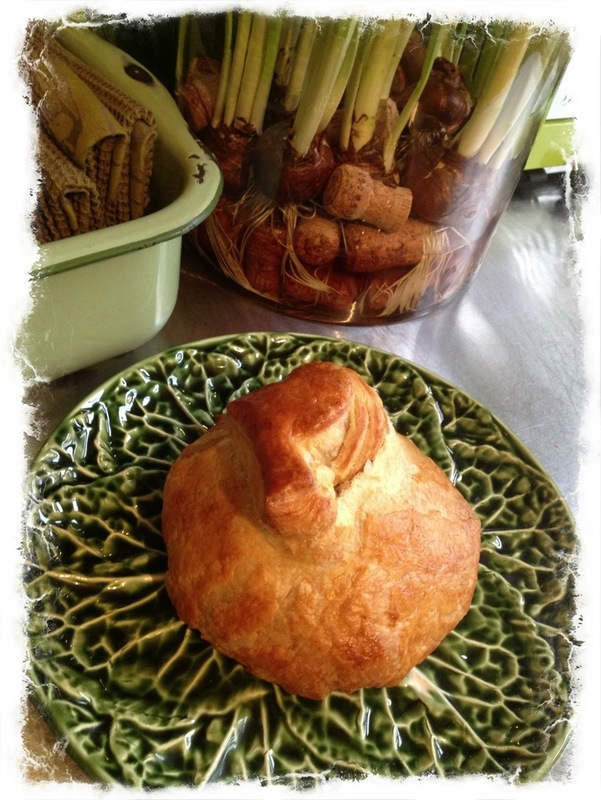 For dessert, I played with puff pastry sheets that I am so fond of. They make anything made in them seem special. This really was the easiest thing in the world to make, I could not wait to share it with you. I will be making this again for sure. 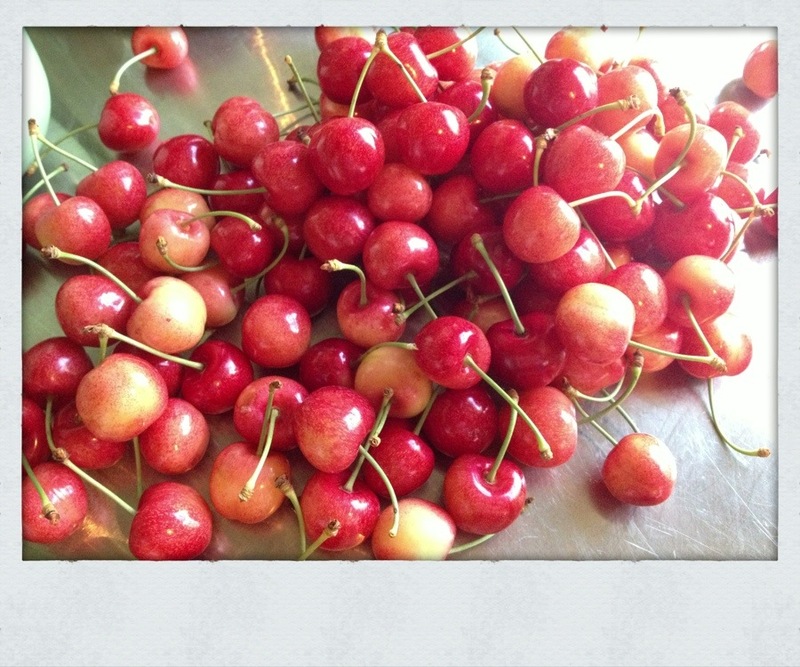 Cherry season is in full swing, so we will have bowls of them around any chance we can. 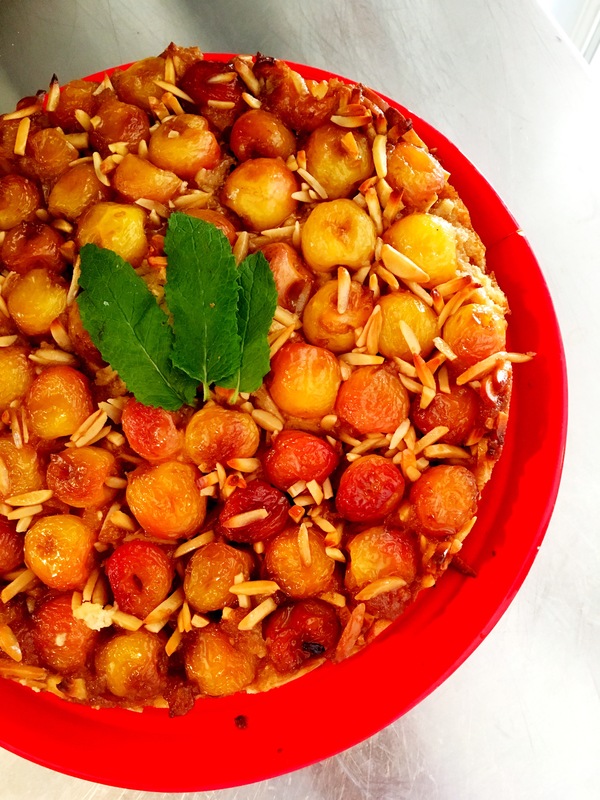 Slice cherries, using the 2 meatiest pieces from each cherry for this recipe. I liked the uniform-ness of the rounds. Put slices in a bowl and mix with a healthy dose of sugar. This will help draw out the cherry juices, which are great in this tart. Then roll out one sheet of the puff pastry, being sure that it has defrosted but is still cold. On a plate or cutting board, spread another liberal dose of sugar. Place the pastry sheet on that, lightly rubbing the sheet so the sugar adheres. Sprinkle more sugar on the top of the sheet, as well. 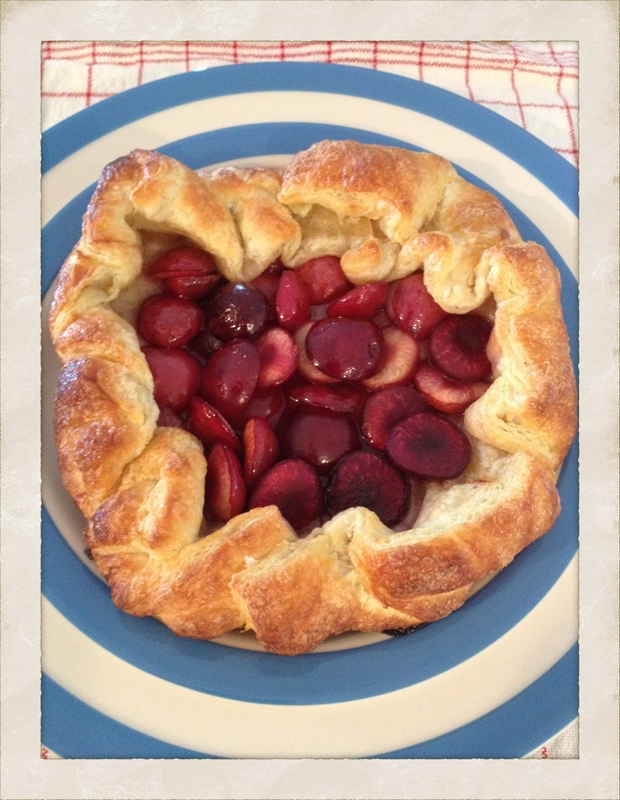 Place the cherries in the middle of the sugared pastry sheet, and crimp and fold the pastry to create a rustic formed wall, leaving most of the fruit exposed in the center. Brush the pastry with an egg wash. That is it! Put on a baking sheet lined with parchment, and bake at 400 degrees for 20 minutes or until puffy and browned. This really is the simplest thing, but it looks so cool and tastes so darn good. Enjoy! I woke this morning to find a lovely post written by my new friend that I made on my last trip to New York, Elizabeth Moyer. We met while we were attending the Blogfest on Design. We hit it off immediately–she is kind, uber stylish, and is a lover of life and the moment. She writes the fabulous blog www.prettypinktulips.com where she shares her insights on living, giving and entertaining with style and grace. Elizabeth asked if I would answer a few questions for a post. She composed such a lovely entry, taking photos from the shops and our home. Thank you Elizabeth!